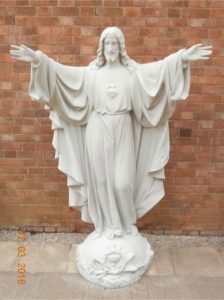 St Augustine’s School is now the home for a statue of the Sacred Heart which was originally located in the grounds of the Convent school in Scarborough. The Convent of the Ladies of Mary was opened in 1886 by the Sisters of Mercy (a teaching order from Belgium – Dames de Marie), although named the Convent of the Ladies of Mary. In 1893 the new Convent was built and dedicated to Our Lady of the Sacred Heart. The statue was located in a quiet garden area of the school grounds near the chapel. When the Convent closed in July 1975 it was sold to the North Yorkshire County Council where Graham School year 10 and 11 pupils studying for O level exams would be based. This is now Maria’s Court, housing many local elderly. 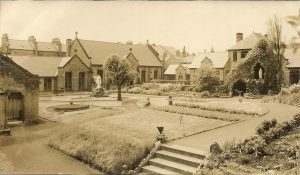 The grounds were later altered and the statue moved from its original setting to the area behind the YMCA (now a car park) which occupied the St Thomas Street sections of the extended Convent buildings of the 1960/70’s. Really the deterioration of the hands and base escalated at this point. At the Convent reunion in July 2012 we began an appeal to the old girls to help restore and relocate the statue to a more fitting environment. After meetings with Steve Marsh at the YMCA and discussions with Mark Taylor and Aidan, from Rotherham’s stonemason (parent company of our local stonemasons Pindar), we finally achieved our goal in raising £4,500 for the renovation and removal of our much loved statue to St Augustine’s where, it will eventually be moved to a planned garden area, more spacious and in keeping with the statue’s original location. When deciding where the statue would be appreciated and safe, St Augustine’s school grounds was the choice of all who have helped raise the funds. 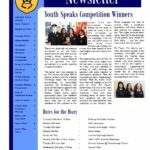 We are carrying on the tradition of the old Convent, in education, both academically and spiritually, and all faiths as in the past. There have been many prayers said quietly before this statue over many years, long may this continue! The fundraising list is impressive from the organisers ‘old girls of 1954’ who began the Convent in that year, all past pupils, Lesley and Maisie Atkinson for all their scrummy cakes sold in aid of our appeal, the parishioners of all the Catholic churches in Scarborough, and especially those who wish to remain anonymous (£600) after our Scarborough News item in October 2015. Moving the statue has been a labour of love, and we are so pleased to finally hand over to the new generation to protect and keep for the future. When deciding where the statue would be appreciated and safe, St Augustine’s school grounds was the choice of all who have helped raise the funds. We are carrying on the tradition of the old Convent, in education, both academically and spiritually, and all faiths as in the past. There have been many prayers said quietly before this statue over many years, long may this continue!